If you think about it, everyone has one or two mistakes that they will regret for the rest of their lives. They are the mistakes you will likely think about while on your deathbed. Instead of thinking about all of the people you have loved and the really good times you had with them, you will be thinking about that really dumb thing you did when you were 23 years old. That is just how it works. You will probably also think about the time you wasted watching television. I don’t know if that’s true, as I have yet to be on my deathbed, but it seems likely. Here are twelve examples of mistakes that people will likely regret forever. If you are not familiar—I wasn’t—Hinge is a dating app. It is apparently very popular. 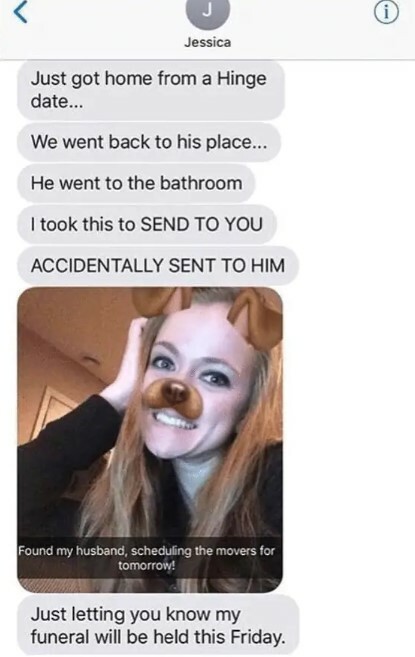 Anyway, this young woman clearly had a very good first date—at first. Unfortunately, it probably didn’t end well. I suppose there is hope that her date found the whole mix up amusing, but I doubt it. In general, guys don’t like women who get really clingy after a first date. You should probably go on at least three dates before you decide someone should be your future spouse. It is hard not to get excited after a great first date, though, so this whole thing is sort of understandable. In general, at least in my experience, most first dates are terrible. I wonder what made this guy so great. I am assuming he was either a male model or extremely rich. Either that or the young woman in this image is extremely desperate to get married. It seems like a lot of people these days are absolutely desperate to get married and will settle for almost anyone willing to make a lifelong commitment. I would laugh at this if I wasn’t kind of nauseous. That is one of the grosser things I have seen this month. I also feel really bad for this young woman. You just don’t serve chicken medium rare. 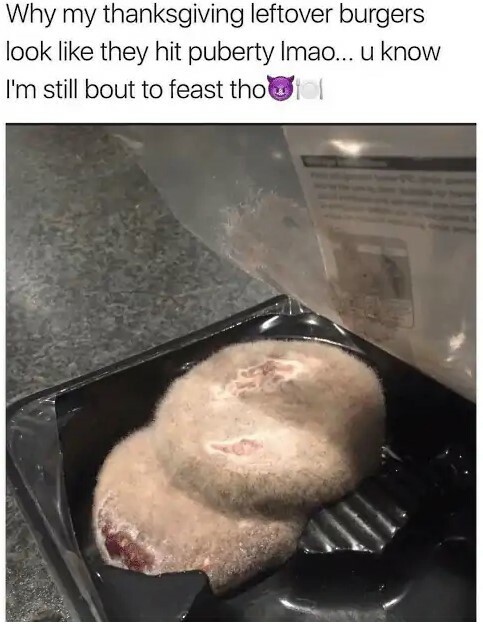 Who taught this person to cook? Eating undercooked chicken is a terrible New Year resolution. In case you are unaware, eating undercooked chicken can lead to salmonella, which is not fun. Abdominal pain and diarrhea are common symptoms. You might also experience vomiting, fever, and muscle pain. It can be life-threatening. 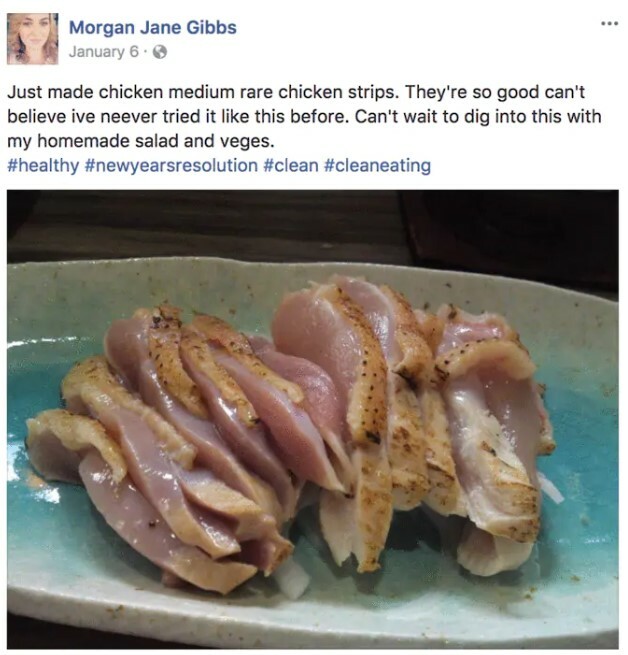 I am assuming this Morgan person did not have a very good night after she consumed the undercooked chicken. I hope someone saw this post and warned her before it was too late. 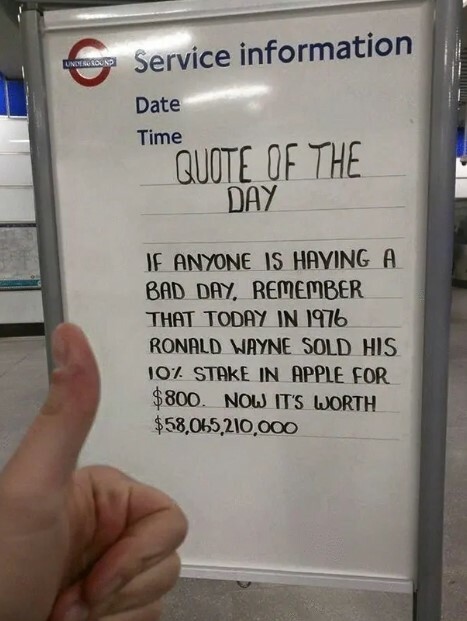 You really have to feel bad for Ronald Wayne. If he hadn’t sold that stock, he’d be one of the wealthiest people on the planet. That’s a mistake that will bother him until the day he dies. He is currently 84, so he probably doesn’t have much longer to regret that horrible decision. I don’t know how I would be able to live with myself if I made such an awful choice. I really do feel for the guy. When I think about Ronald Wayne, I often think about Walter White, who was the protagonist of “Breaking Bad”. Like Wayne, White sold off shares of a company that would eventually be worth billions. Unlike Wayne, however, Walter White went on to make and sell meth. “Breaking Bad” was a great show; the spinoff, “Better Call Saul” is just as good, albeit quite different. Season four of the show is currently airing, and it has been renewed for season five. The show is a prequel to “Breaking Bad”. It shows how Walter’s lawyer became the shady, unethical man that he turned out to be. The person who posted this should not have eaten those burgers. I seriously hope that he or she did not. That’s just gross. I am sure that, if he or she did eat them, that person ended up regretting it a few hours later. In general, you don’t need to see a doctor if you end up with food poisoning. However, there are symptoms that may develop that need proper medical attention. For example, if you have a fever or diarrhea that lasts for more than three days, you should go to the doctor. If there is blood in your vomit, you should absolutely go to the doctor as soon as humanly possible. That’s pretty good advice all around. If you are puking blood, that is a sign that something has gone seriously wrong. In addition, if you experience neurological symptoms, you need to get checked out as soon as possible. Food poisoning has been known, for example, to cause blurry vision. That is not a good sign. The manager of this particular establishment probably regrets this sign; it is pretty hilarious, though. 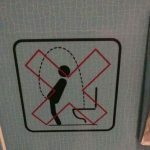 I understand, of course, what was trying to be conveyed; still, this is very amusing. I don’t have children myself, but once in a while, I’ll see a kids’ menu at a restaurant. At times, I am amazed by how expensive meals for children can be, especially if that kid is under the age of five. 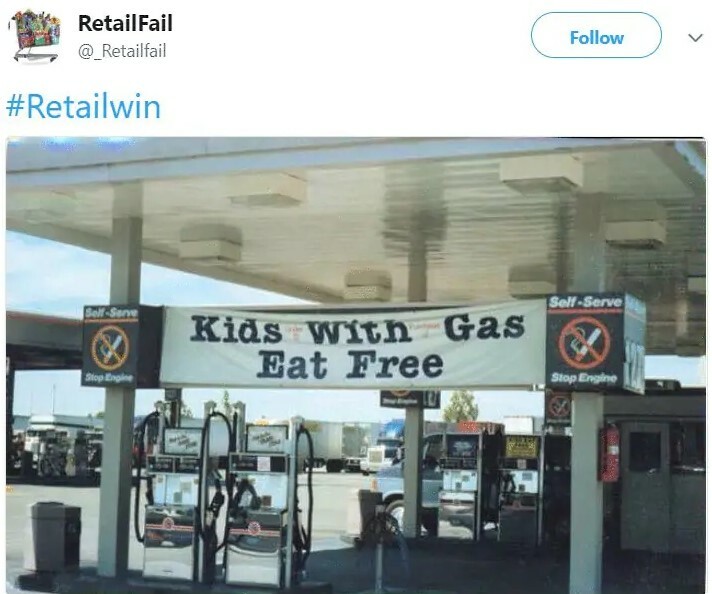 It isn’t like small children typically eat a lot. You shouldn’t have to pay over six dollars for a plate of chicken tenders or a small plate of macaroni and cheese. I don’t mind kids in restaurants so much, but I do mind them on flights. Getting seated next to a kid on a flight is the worst. There should definitely be the option to reserve a seat on flights that are child free. I bet there are a lot of people out there who would pay extra money for that. I was once seated next to a baby who was probably about nine months old, give or take. That little girl would not stop crying, and it was a five-hour flight. The flight attendant refused to let me sit in another seat. It was also nine in the morning when the plane took off, so I got dirty looks from her mother when I started drinking as soon as possible. Was she worried I’d set a bad example for her infant daughter? The sister in this image was clearly drunk. She probably regrets this picture. I am assuming both the bride and groom were a bit tipsy themselves. 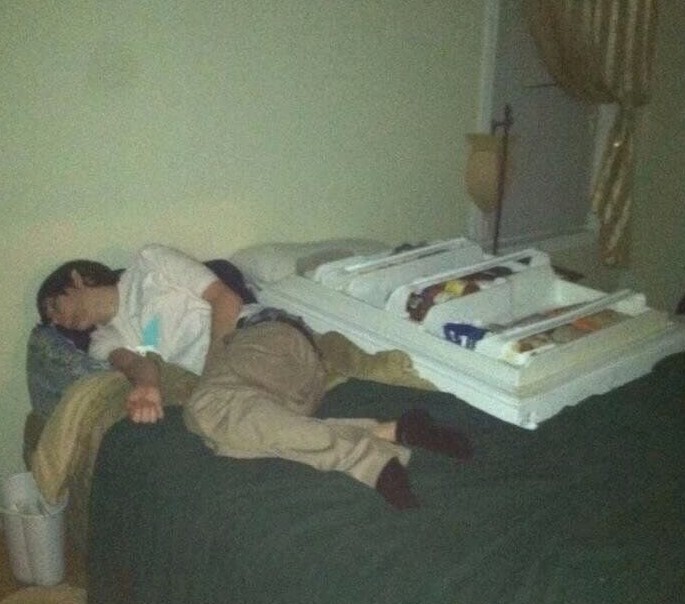 They just know how to hold their liquor, apparently. I love the judgmental look from that other bridesmaid. 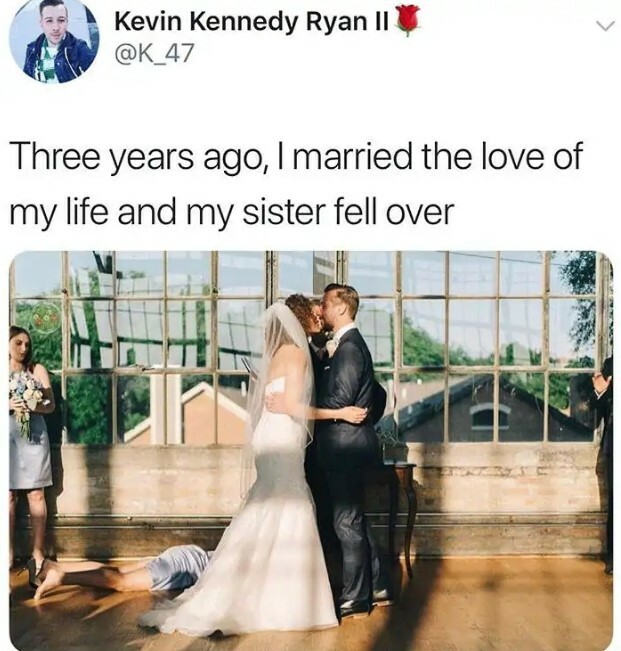 To be fair, the sister sort of deserves it. I am not saying there is anything wrong with having a glass of wine or a glass of beer before a wedding, but you should be able to stand through the entire ceremony if you are technically part of it. Still, weddings can be very depressing events if you are single. I went to a wedding last summer, and I was thrilled to be invited. The bride is one of my favorite people on the planet, and her husband is a great guy. Still, as I watched them say their vows and dance their first dance, all I could think of was the fact I’ll likely die alone and unloved. I am sure a lot of people feel that way at weddings. Finding the right person is hard, and some of us are just far too lazy to put in the necessary effort. It was a great wedding, though; I was only sort of depressed for a grand total of five minutes. It was relatively casual, I didn’t have to wear a tie, and they served mead! 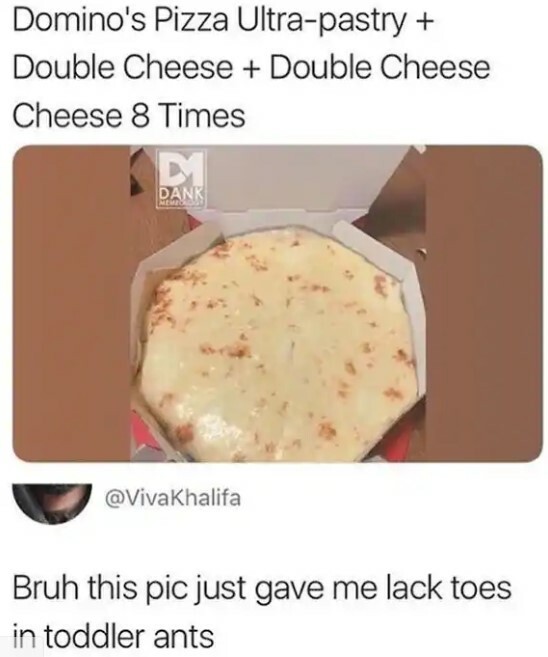 I can’t imagine eating this pizza. 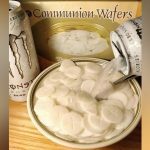 I would throw up. Then again, I don’t really care for cheese. When possible, I order my pizza without the stuff. In this case, I think the regret comes when you realize how many calories you actually consumed. Almost everyone loves pizza, but it isn’t exactly the healthiest meal in the world. There are almost 300 calories in the average slice of cheese pizza. If you add toppings, you’re looking at 400 calories—or more. There is also a lot of fat in pizza, and that is largely because of the cheese. 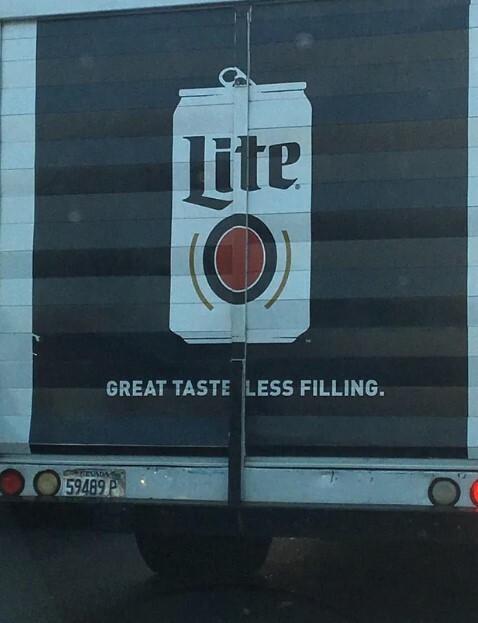 It does look like this truck is suggesting that Miller Lite is “tasteless” Somebody regrets that marketing decision, I am sure. I actually like Miller Lite. I wouldn’t say the taste is great, per se, but it certainly is not bad. Compared to other beers, it doesn’t contain many calories. There is a reason that people have been enjoying it since 1973. It is definitely one of the more popular light beers in the United States. You can get a Miller Lite at pretty much any bar you visit. I like everything about this image, although it seems the driver of this vehicle definitely regrets the decision to buy an expensive car. I can’t blame him or her, frankly. Cars are extremely expensive, and the simple fact of the matter is that they won’t last forever. It doesn’t matter how much money you put into them; they will stop working eventually. I don’t drive much myself, so I’m hoping my car lasts until at least 2030, but I wouldn’t be surprised if it crapped out long before then. It amazes me that there are cars out there that literally cost millions of dollars. Prior to my research, I was under the impression that the most expensive cars in the world only cost about a quarter million, but I was apparently very wrong. The most expensive car in the world actually costs almost $5 million. Who would buy that? 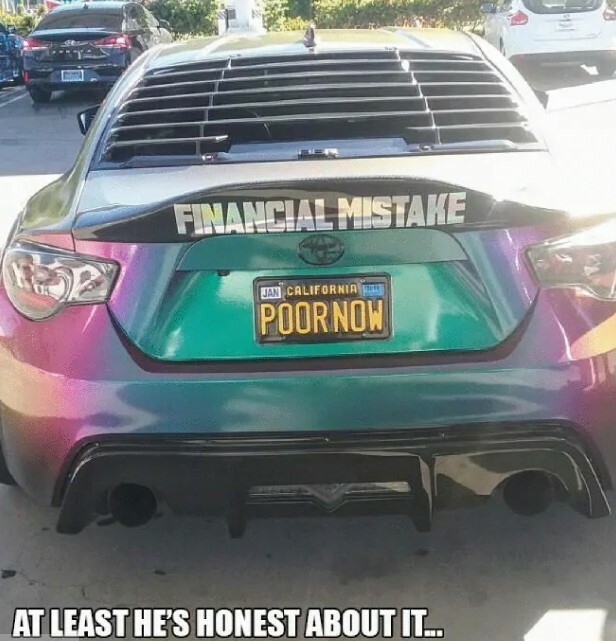 Unless you are trying very hard to impress your neighbors or literally have money to burn, that is a ridiculous amount of money to spend on a vehicle. Even if it goes really fast, there are speed limit laws in place, and you’re just going to end up stuck in traffic half of the time. I have no idea what happened here, but I am assuming there was a big mistake made. Why would you put that in your bed? Still, that is not the worst mistake anyone has ever made. I am assuming alcohol was involved in this particular situation. The person probably just woke up, wondered what the heck happened, and shrugged. I hope it was a fun night. Those are ugly shoes. 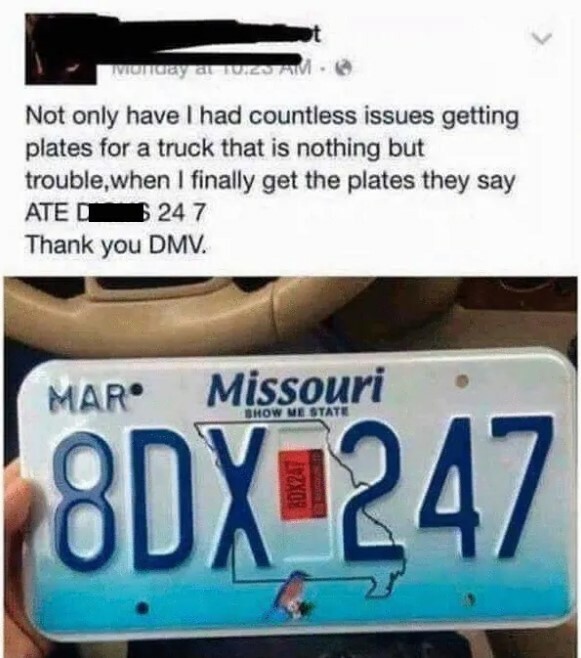 Where were they purchased? I suppose it really is the thought that counts, though. Who amongst us hasn’t gotten a really ridiculous gift? All you can really do is smile, say “thank you”, and hope that you come across as remotely sincere. 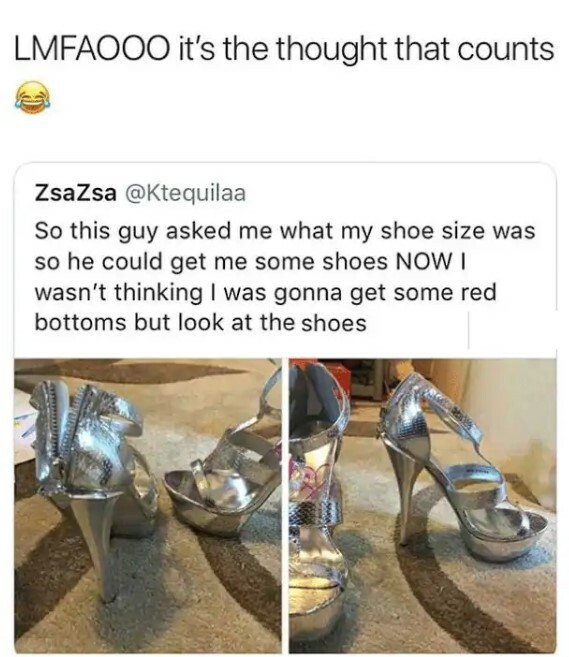 I really want to know how the person who posted this ended up having a guy offer to buy her shoes. Is that a thing on the dating scene now? Is it common to offer gifts of clothing and footwear?